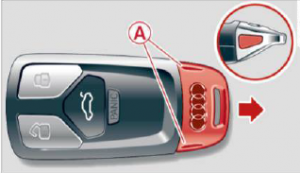 You are browsing the Blog for Audi A4 Archives - Audi How To. 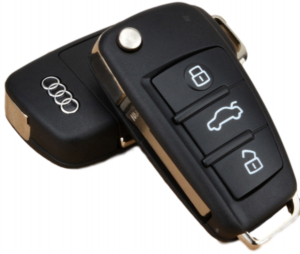 This tutorial explains how to replace the key fob battery in Audi A3 8P, 8V (2003 – 2018), Audi A4 B7 (2004 – 2009), Audi A6 C6 (2004 – 2011), Audi Q3 8U (2011 – 2018), Audi Q7 1st. 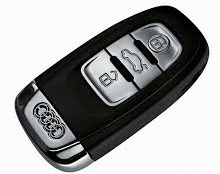 Gen. 4L (2005 – 2015), Audi R8 I (2005 – 2015), Audi TT 8J (2006 – 2015) with key fob pictured below. – If you press a button quickly, the LED blinks once. 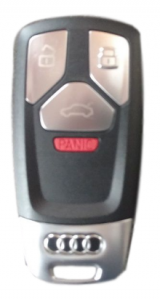 – If you press a button longer (convenience opening), the LED blinks several times. – If the LED does not blink, the remote control key battery is dead. 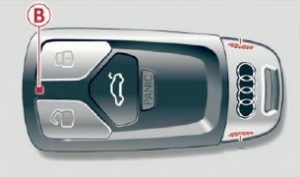 The message “Please change key battery” can also appear in the instrument cluster display. 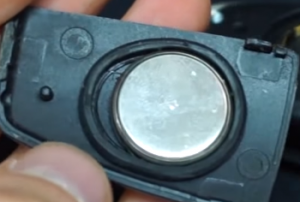 Replace the battery. 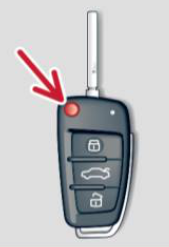 Step 1: Press the release button (red arrow). Step 2: Pry apart the base (A) and the cover (B) carefully with a coin. Remove the cover (arrow). control key. Insert the mechanical key. 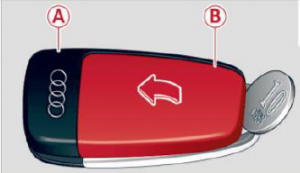 Battery orientation is with the (+) side down in relation to the cover. 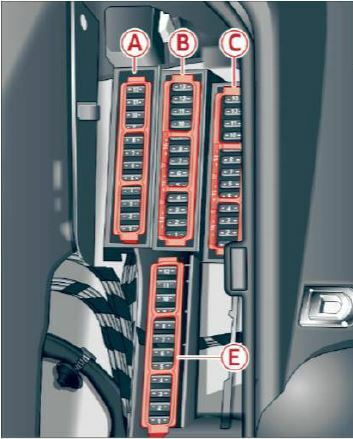 The Audi A4 B8 (2007 – 2015) have 3 fuse boxes locations. 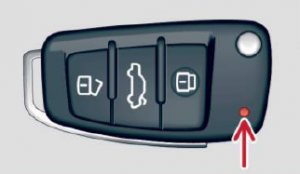 One on each side of the dash and a third one on the right side of the trunk. 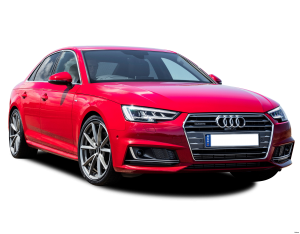 The launch control on your 2011 to 2016 Audi S4 S-tronic provides the best acceleration possible when starting from standstill. 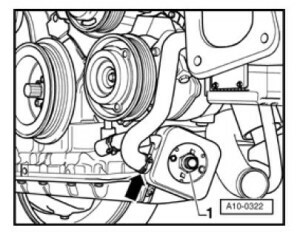 To enable it, first make sure that the engine is at normal operating temperature and that you have the stering wheel facing in straigh line. Step 1. With the engine running, press the ESP OFF button. 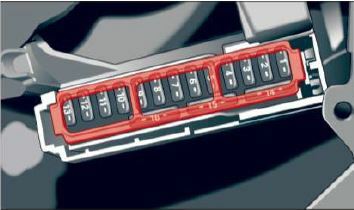 The ESP Off light in the instrument cluster will appear with a message “ASR Off Caution! Limited driving stability”. Step 2. 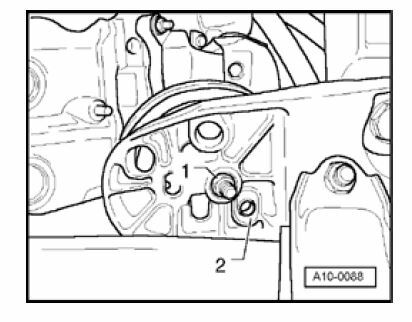 Move the gear selector lever to the S position. Step 3. Press the brake pedal strongly with your left foot and hold it down. Step 4. At the same time, press the accelerator pedal down completely with your rightfoot until the engine reaches and maintains a high RPM (3000 to 4500 rpm). Step 5. Within 5 seconds, remove your foot from the brake pedal and… there you go! Be aware that the transmission temperature may increase considerably after using the Launch Control Program. If that happens, Launch Control will be unavailable for a few minutes. It will be available again after a cooling period. 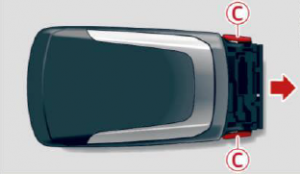 When accelerating using the Launch Control program, all vehicle parts are subject to heavy loads. 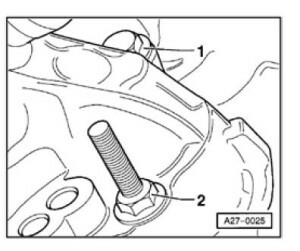 This can result in increased wear. All cable ties opened or cut during engine removal must be reinstalled at the same locations. 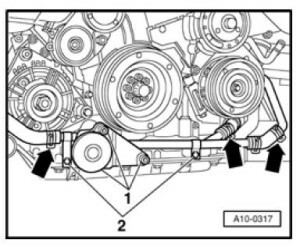 Remove engine without transmission toward the front. 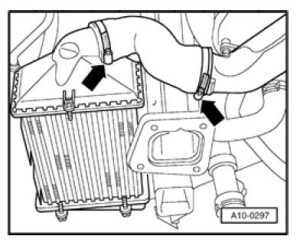 Drained coolant must be stored in a clean container for disposal or reuse. Always replace seals and gaskets. Do not open coolant circulation system. 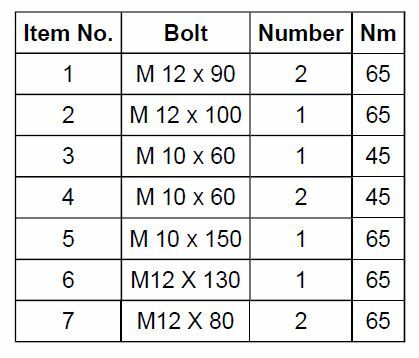 – First determine whether a coded radio is installed. If so, determine the correct coding. – Switch ignition off and disconnect battery Ground (GND) strap. 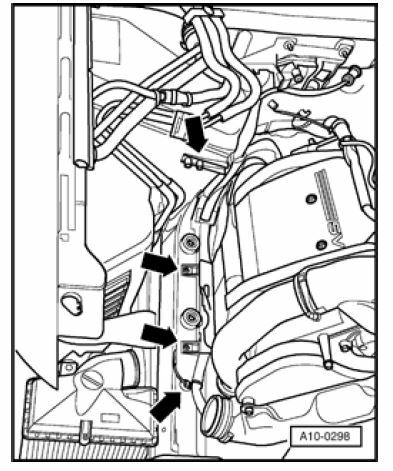 – Remove bolts (arrows) and remove engine covers -A- and -B-. 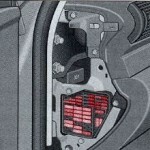 – Remove cover above air filter. – Remove sound-proofing material (arrows). 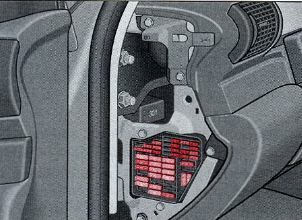 – Remove bracket for sound-proofing at unit support. 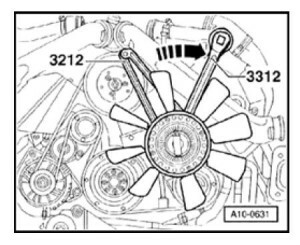 – Remove viscous fan counter-hold using 3212 spanner wrench. The viscous fan has a left-handed thread. aligned (arrow). 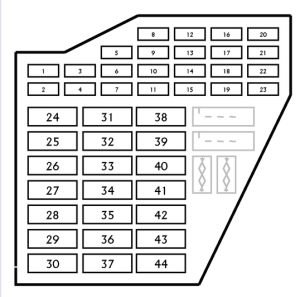 Counter-hold in position using 3204 drift. 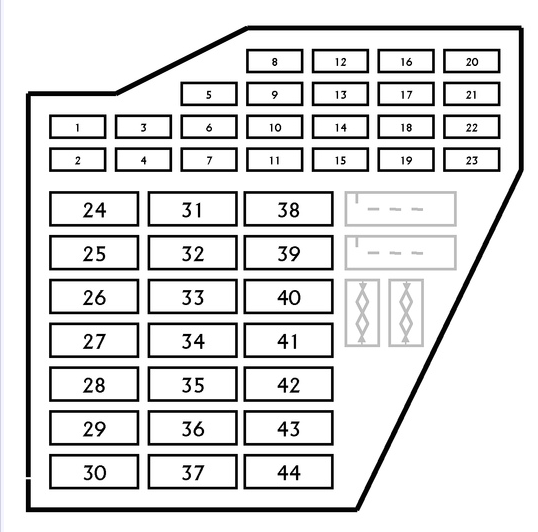 Mark direction of rotation of ribbed belt. Reversing the direction in which it runs can ruin it. – Remove coolant reservoir (arrows). – Disconnect connector for coolant level display. 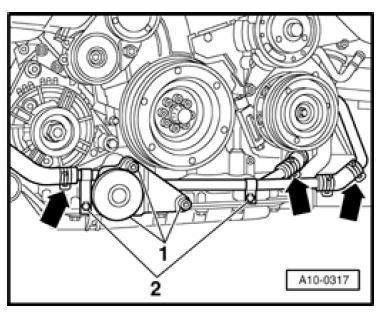 – Remove valve cover (cylinder bank 4-6). 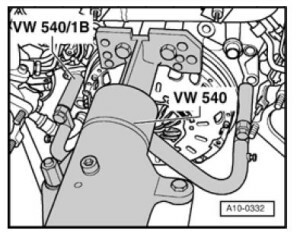 – Remove hose -1- to vacuum reservoir. 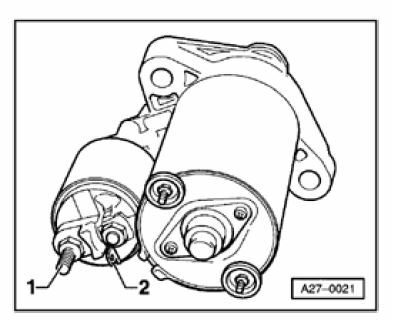 – Remove air distributor (arrows). – Disconnect fuel supply and return lines -1- and -2- and move aside. – Remove hose from Evaporative Emission (EVAP) canister purge regulator valve -3-. – Disconnect connector -1- at Mass Air Flow (MAF) sensor. 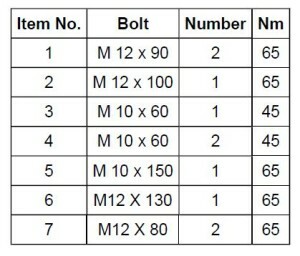 – Disconnect connectors -2- from power output stage and lay cables aside. – Disconnect connector -1- for oxygen sensor at bulkhead. – Disconnect connector -2- for knock sensor. – Disconnect harness connector -3- and move cables clear. 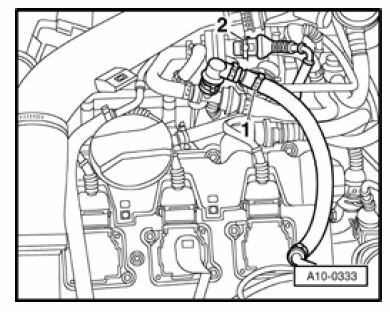 – Remove pressure hoses (arrows) from charge air cooler to left and right pressure lines. – Disconnect cable at B+ on battery. – Disconnect B+ battery cable. 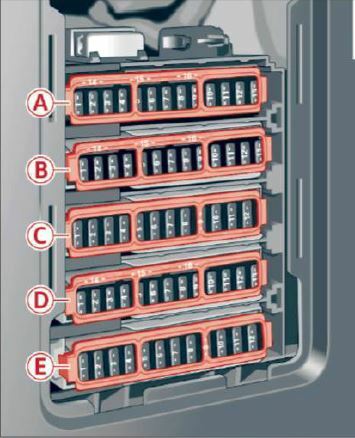 – Move aside cables to starter together with cable channels (arrows). – Disconnect hose from power steering reservoir to power steering pump with special tool 3094. – Disconnect power steering hose (arrow). – Disconnect hydraulic line (arrow). – Disconnect harness connector from vehicle speed sensor. – Disconnect harness connector from reverse gear switch. – Remove wiper arms (arrows). 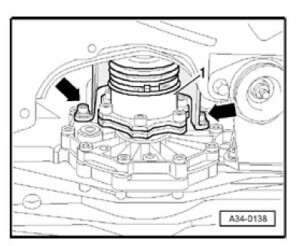 – Disconnect retaining clip -1- at water deflector. – Pull off left and right retaining clips -3- on water deflector. – Remove cover -2- from E-box (electronics box). 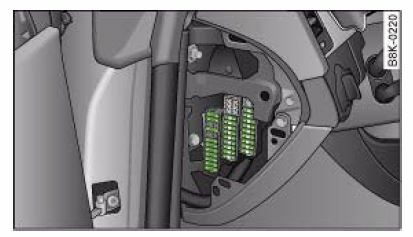 – Open E-box in plenum. – Unclip ECM retaining bracket. 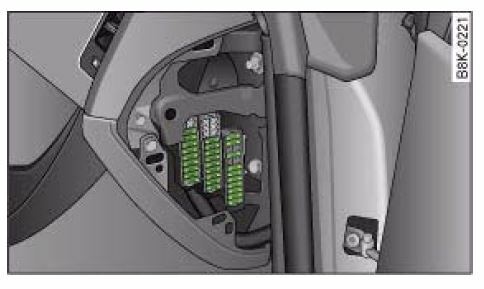 – Remove ECM, disconnect harness connectors -2- and -3- and remove. 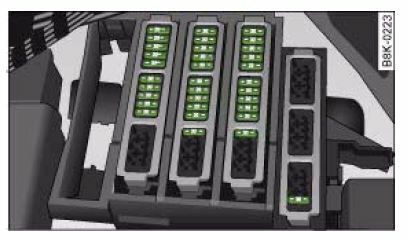 – Disconnect harness connectors -1-. – Remove hose -1- to power brake booster at bulkhead. – Disconnect ground (GND) -3-. – Pull connector -4- out of bracket and move wiring clear. 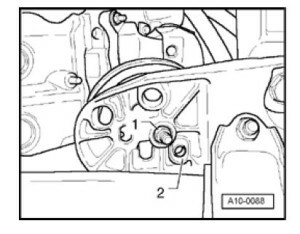 – Remove bracket for harness connector. – Remove both coolant hoses to heat exchanger at engine by un-clipping retaining clips on flange. – Remove hoses (arrows) from turbocharger to left and right charge air coolers. – Move aside cable -1- to starter by cutting cable tie and un-clipping bracket (arrow). – Remove hose -2- for cooling generator. 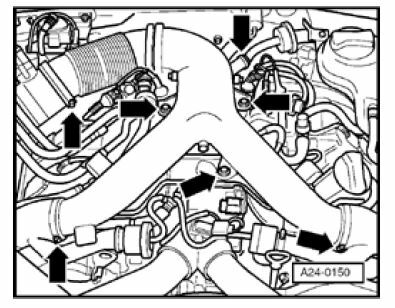 – Disconnect ground (GND) (arrow) from engine support. 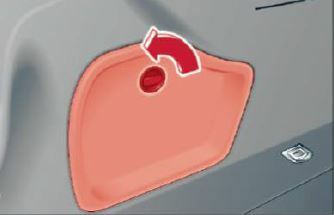 – Remove hose clamp (arrow). 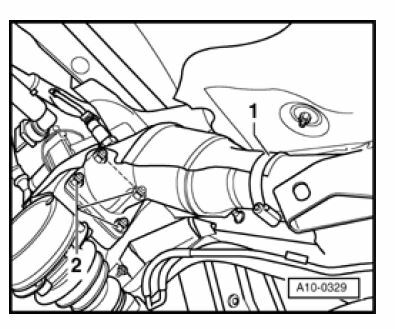 – Remove intake manifold -1-. 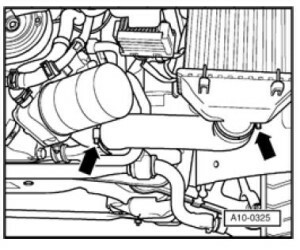 – Remove coolant line -2-. 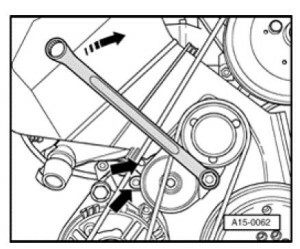 – Remove torque support -1-. – Remove hose clamps (arrows). – Place VAG 1306 Drip Tray beneath engine. 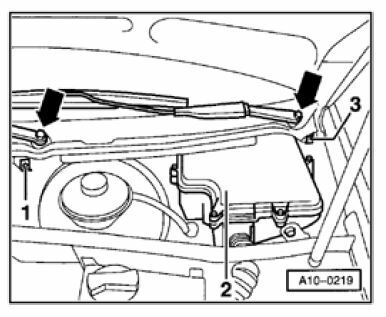 – Remove hose clamps (arrow). – Remove oil cooler -1-. 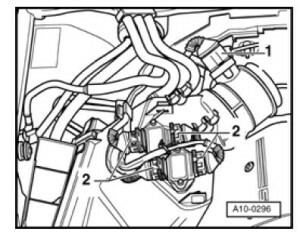 – Remove heat sensor -1- from right turbocharger using 3035. 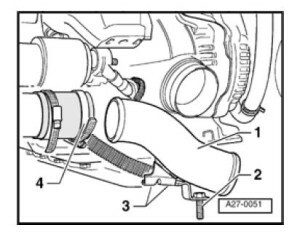 – Remove heat shields -2- from left and right turbochargers. – Remove upper bolts -3- to front line to left and right turbochargers. 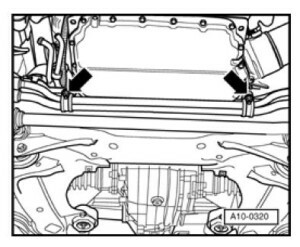 – Remove heat shield (arrows) above left and right drive axle to transmission. – Remove hose clamp -1- from left and right heat shield for turbocharger. 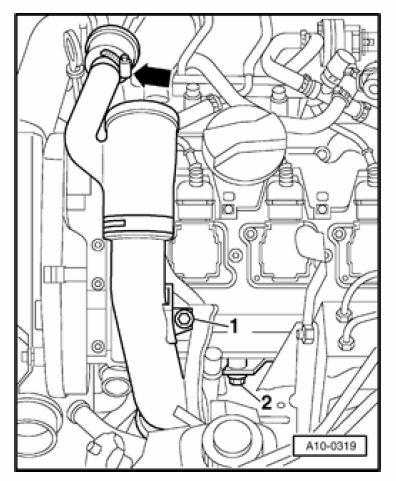 – Unbolt left and right exhaust pipes -2- from turbocharger. 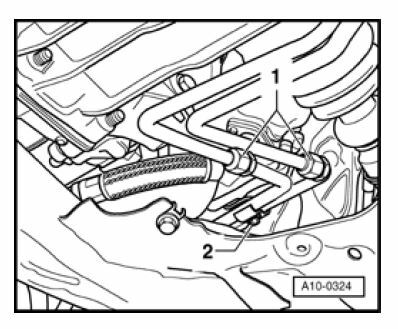 – Unbolt coolant lines to oil pan (arrows). 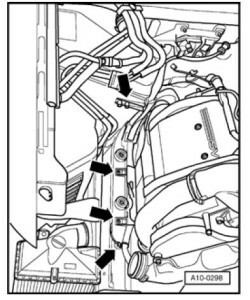 – Disconnect transmission fluid lines -1-. 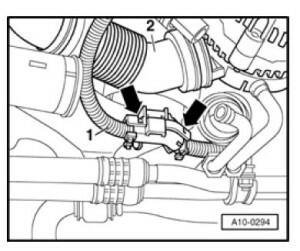 – Disconnect oil line at turbocharger -2-. 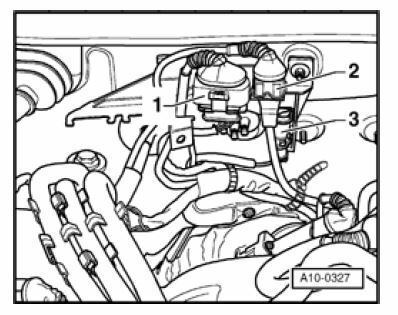 Do not open the refrigerant circuit of the AC system. 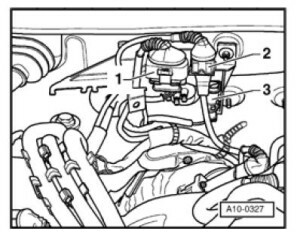 – Remove A/C compressor -1…2-. 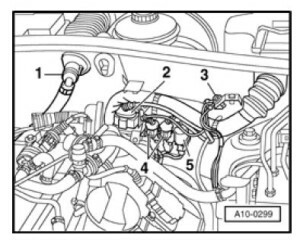 – Attach A/C compressor (with refrigerant hoses attached) to vehicle using wire. When installing pay attention to guide bushings. When installing first insert bolt -1- in A/C compressor. Do not bend or stretch lines or hoses as condenser and/or refrigerant lines/hoses may be damaged. 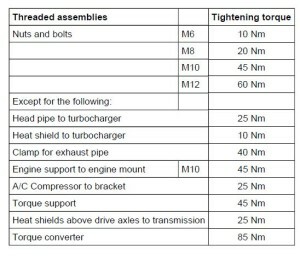 – Mark installation positions for threaded assemblies -1- and positioning sleeves -2-. 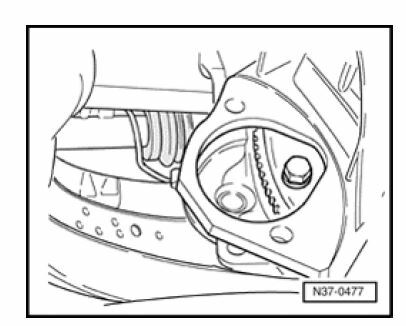 – Remove nuts -1- on left and right engine mounts. When installing, make sure that locating sleeves -2- engage again. cooler supported in 3x rubber bearings. – Disconnect air guide at generator support -3-. – Remove generator -4- downward and out. 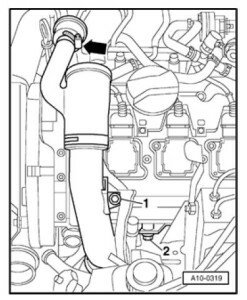 1 – Remove air intake -1-. – Disconnect connector for terminal 50 -2-. 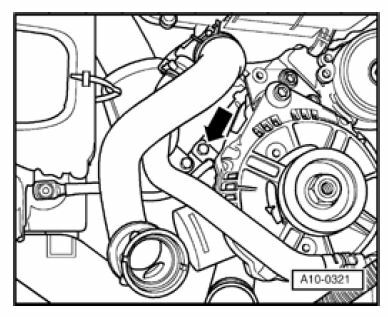 – Remove starter forward and out. – Using special tool V175 disconnect torque converter from drive plate. 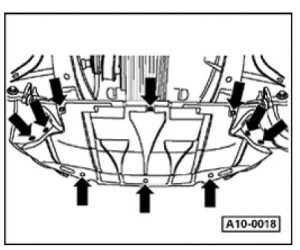 – Position 10-222A engine support bridge on bolted flanges of fenders. 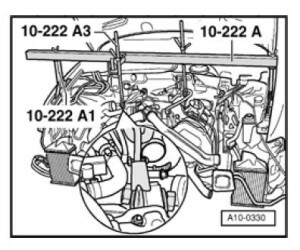 – Using 10-222 engine sling together with 10-222A1 engine support bridge and 10-222A3 lift engine up. – Remove flange bolts from below. – Remove flange bolts from above. – Attach 2024A engine sling at right-rear and left-front and secure. 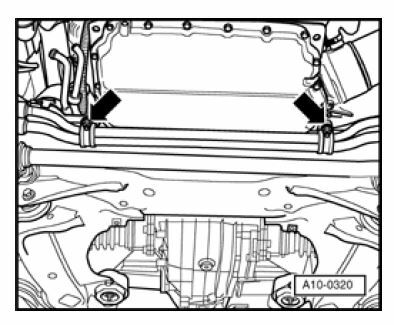 To properly balance assembly, mounting hooks must be inserted in rails as shown in illustration. – Remove front left wheel. 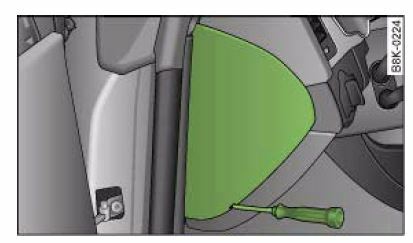 – Support transmission using floor jack. – Push engine crane into position and attach to engine sling. 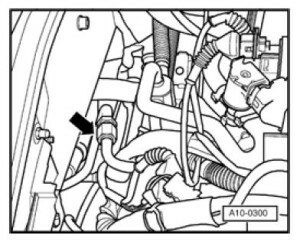 – Carefully pull engine out toward front until free. 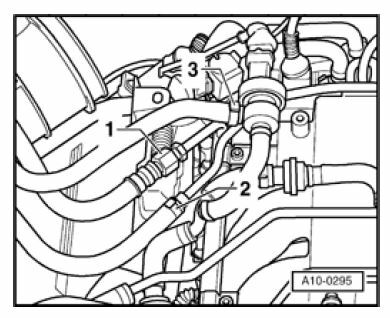 – Guide engine forward out of engine compartment. – Remove spacer between engine and transmission. 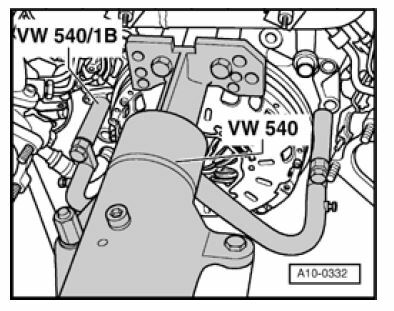 540 Holding Fixture together with VW 540/1B auxiliary pieces. 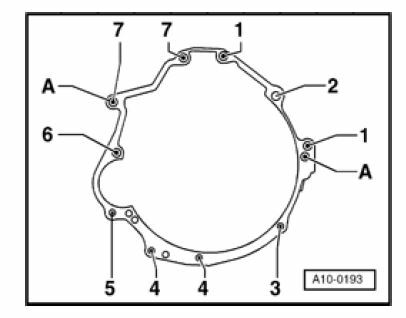 Always replace self-locking nuts, bolts as well as gaskets and O-rings. 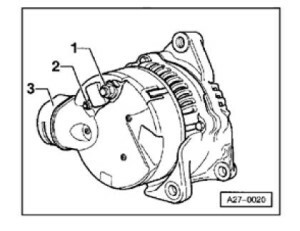 => Repair Manual, 6 Spd. 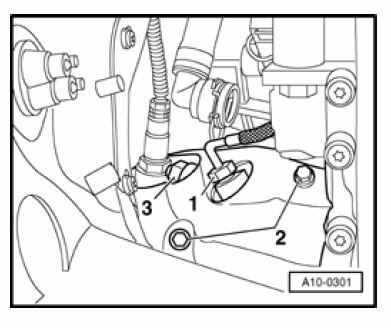 Manual Transmission 01E, Repair Group 30-Make sure centering sleeves for engine to transmission are correctly installed in cylinder block. Install or replace if necessary. – Lubricate splines on transmission input shaft lightly using thin coating of G 000 100. Do not lubricate guide sleeve for release bearing. 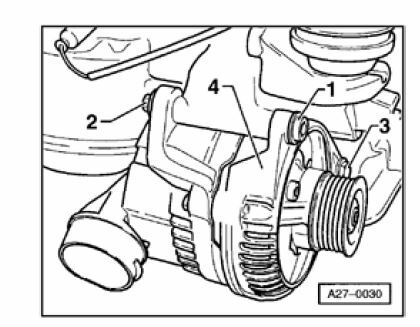 – Check centering of clutch disc. 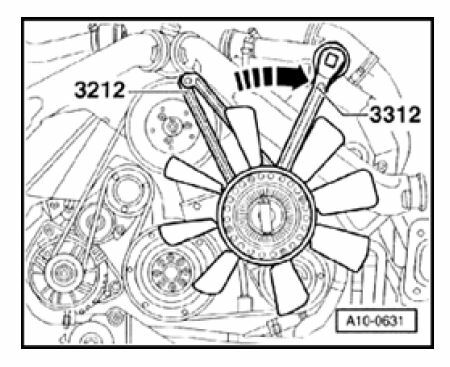 – A pilot needle bearing must be installed in the crankshaft in engines for vehicles with manual transmission. Install if necessary => page 13-35. 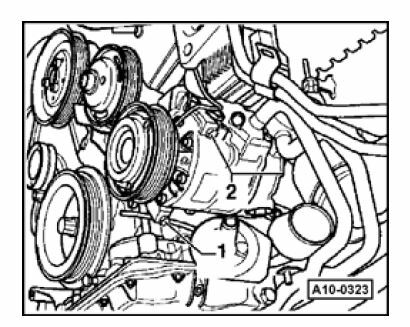 – Install spacer between engine and transmission. – Install ribbed belt => page 13-1. – Fill up coolant => page 19-19. 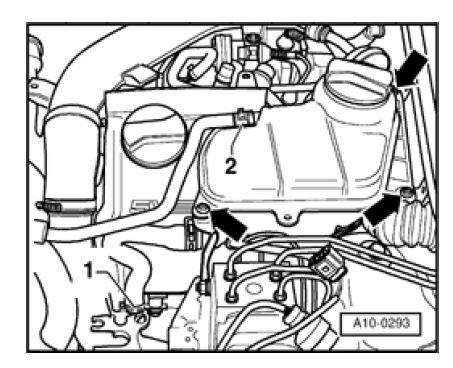 Only reuse drained coolant if cylinder head or engine block was not replaced. Dirty coolant must not be reused. motions before tightening engine mounts. – Install lock carrier with attachments. – Install exhaust system free of stress. 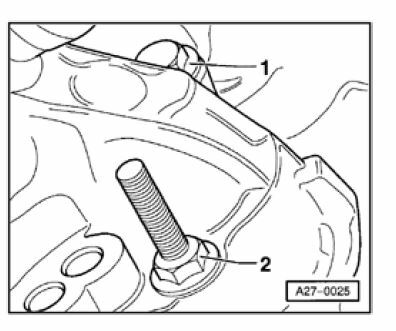 – Only remove and install spark plugs using 3122B spark plug removal tool. 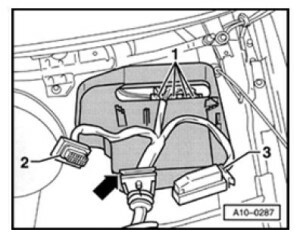 After connecting battery, enter anti-theft code for radio. 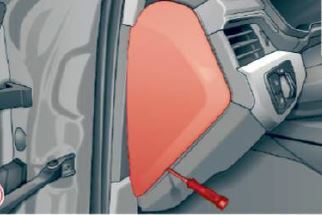 – Fully close front power windows to stop. – Set clock to correct time. 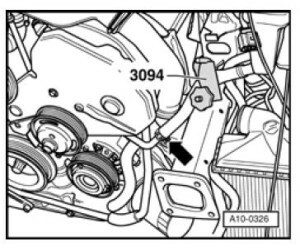 – Check engine oil level before starting engine. Tightening torques are valid only for nuts and bolts that are lightly greased, oiled, covered with a thin coat of phosphate or blackened. Additional lubricants such as engine or transmission oil may be used as long as they do not contain graphite. Do not use any degreased parts. 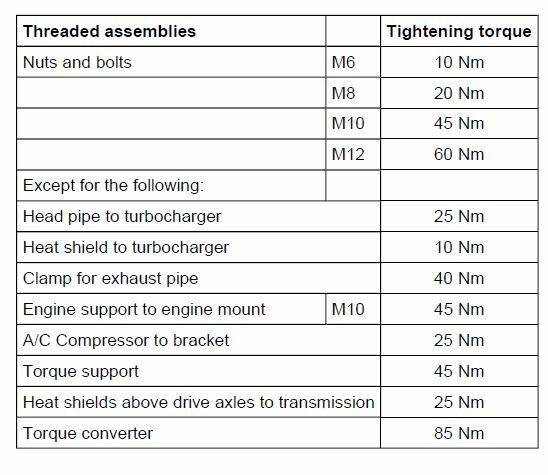 Permissible deviations for tightening torques ” 15%. 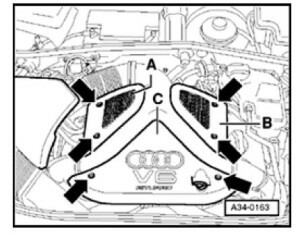 The Audi A4 B6 and B7 fuse box is located on the left side of the dashboard (see image on the right). 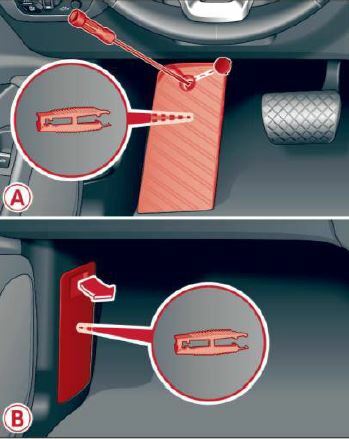 To access it you must have the left hand side door open and remove the side dash cover, pushing it. 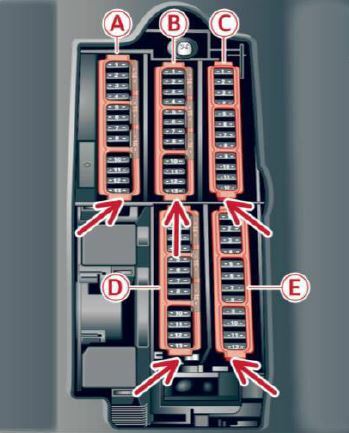 Check fuses position on the image.